Fluid Flow (CFX, Poly Flow, and Fluent): It is an analysis system where you can simulate flow of fluid over and past any object.It will be very helpful when dealing with aerodynamics because if you want to calculate the lift produced by conventional methods it will be difficult. nd motion of the bodies in a complex assembly. In this analysis system you have to provide joint rotations and forces that actually resemble the scenario. 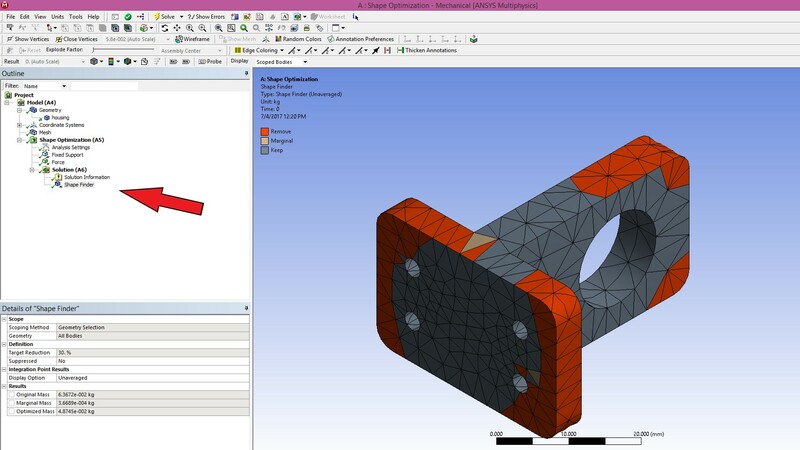 Static Structural: In Static Structural you can find out the stresses, strains and displacements of the design. In this you have to provide the forces and supports on the bodies. nding out the behaviour of the model under given thermal environment. 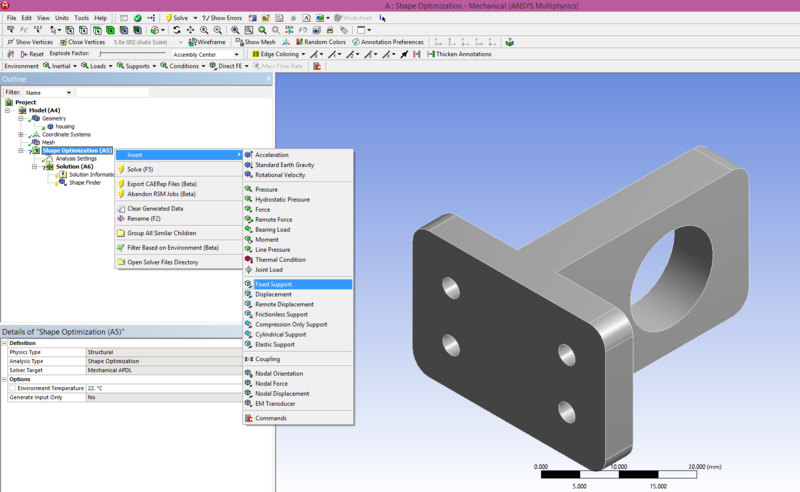 helpful when there is a limitation in the weight parameter of the design. 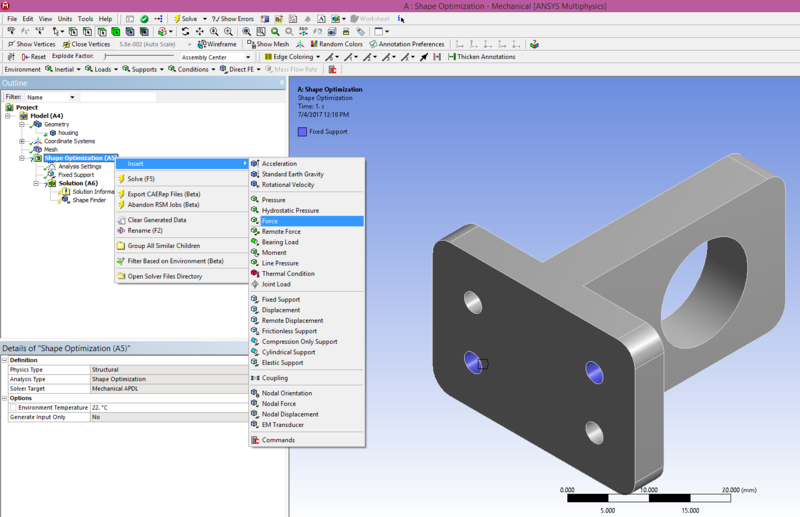 Using this you can find out where the material can be removed to reduce the weight of your design. bench application. 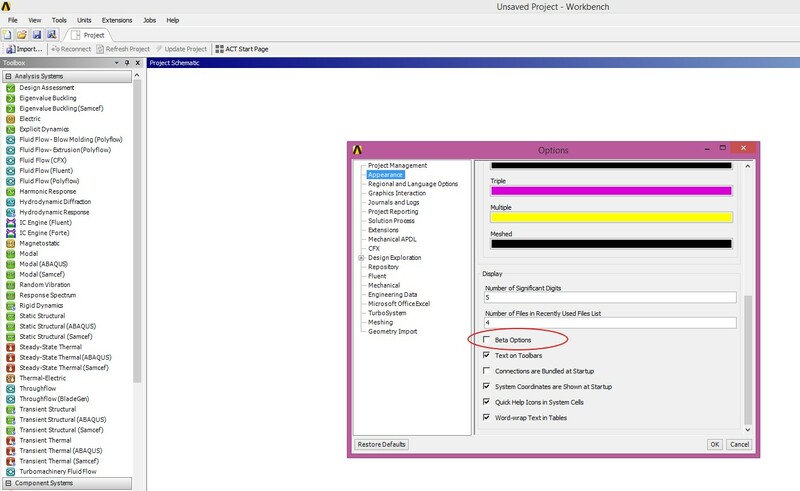 This is the window you will see when you open Ansys Workbench. 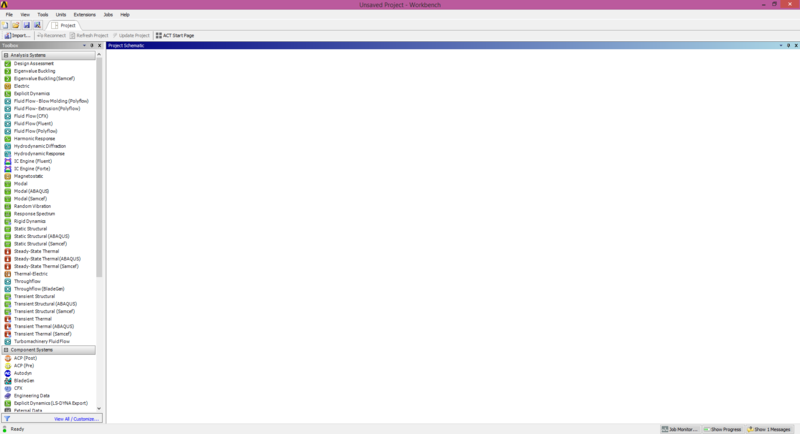 Here you can see Shape Optimization is not available. 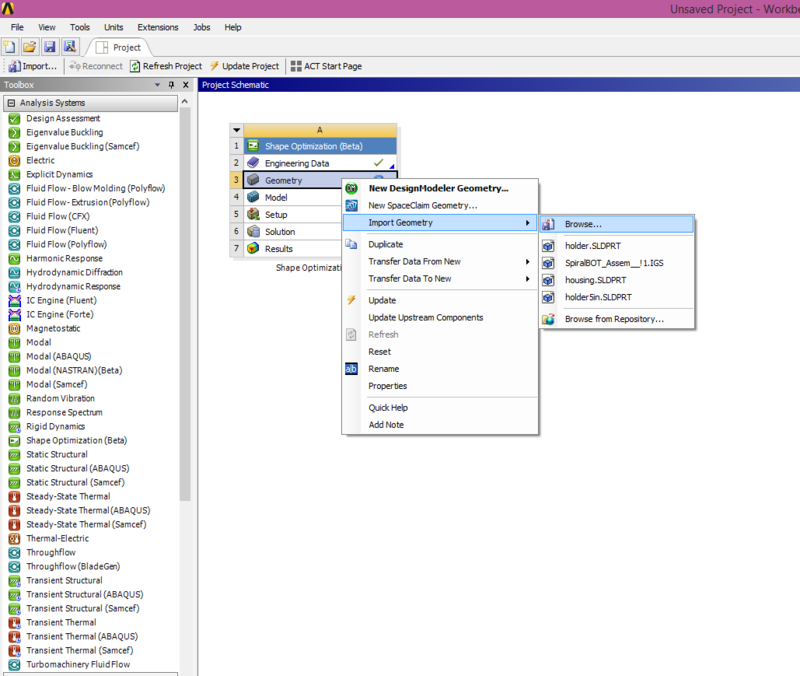 Open Tools menu in Ansys and select options. In Options window go to Appearance tab and scroll down. Enable the `Beta Options’ check box. 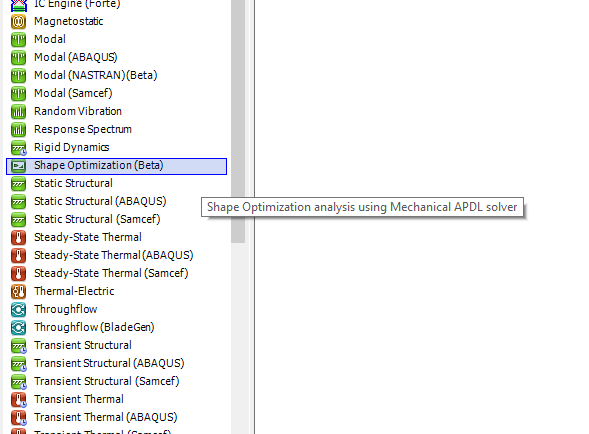 Press OK.
Now you will find Shape Optimization (Beta) in analysis systems. 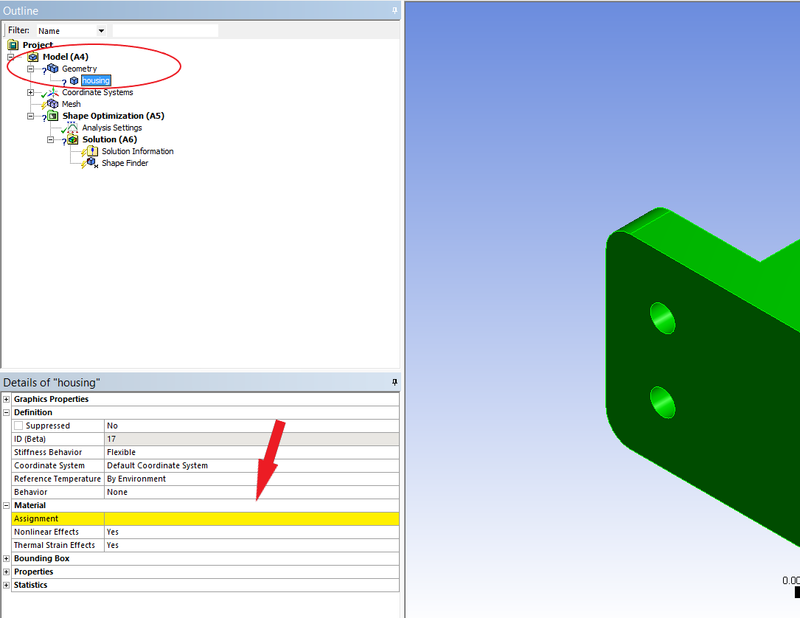 Double click the Shape Optimization (Beta) to open in Project Schematic. won’t get it then try conveting the sldprt part into IGES or STEP format. 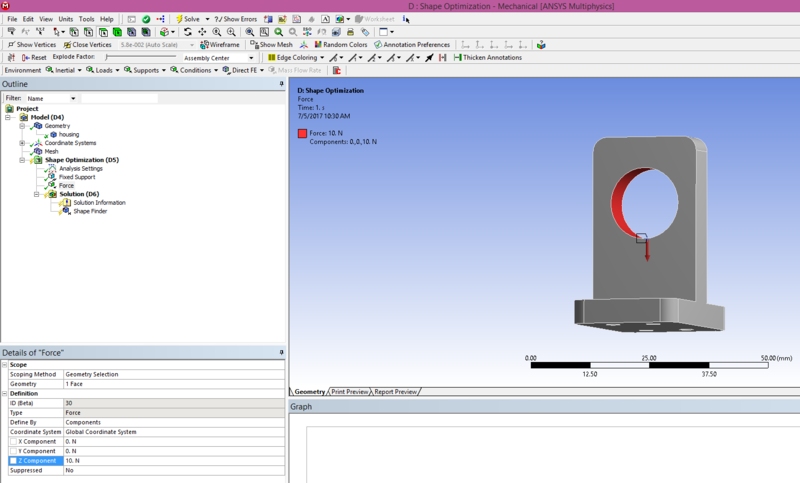 Double click Model, you will get Ansys Mechanical. Initially you will see the symbol of question mark for the Geometry and yellow colour for the material assignment. 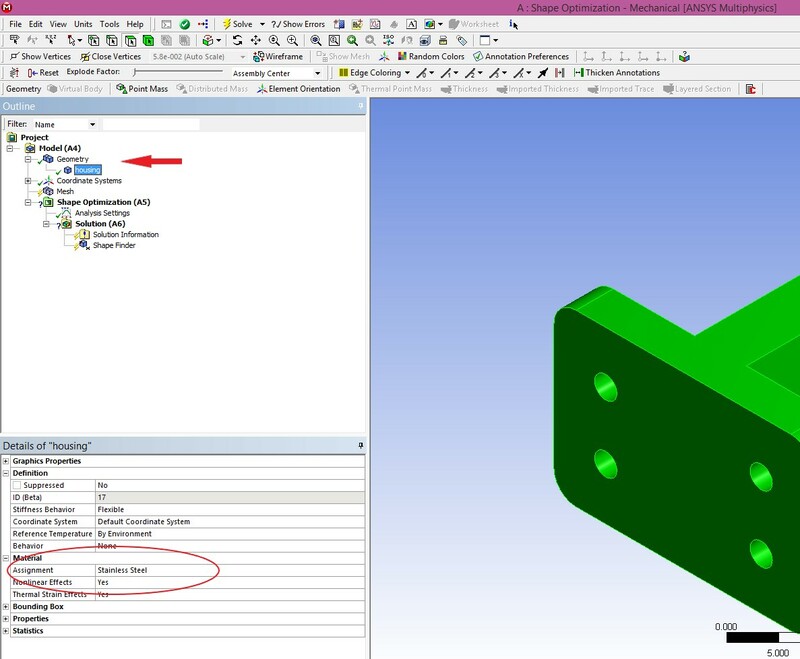 Select the material of your part by clicking the assignment in material section. Here Stainless Steel material is selected. The material is assigned and the question mark will be replaced by tick mark beside the Geometry. Right click the Mesh and click Generate Mesh. 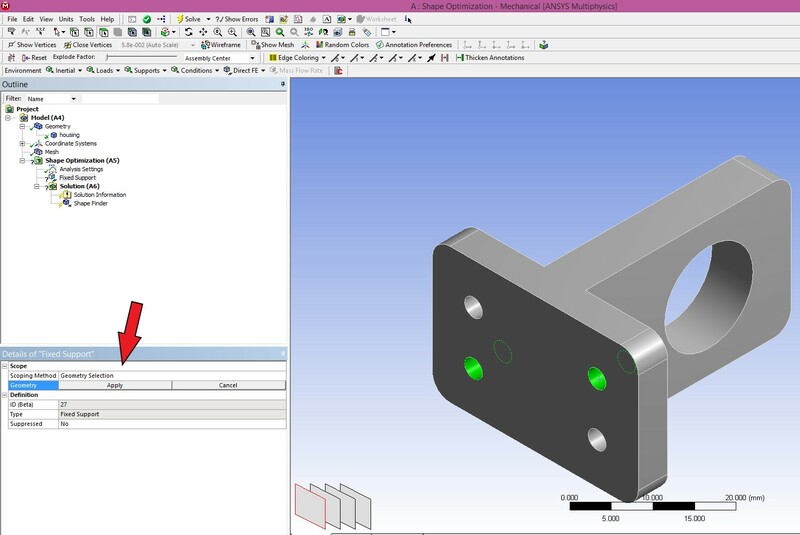 Right click the Shape Optimization and select Insert and Fixed Support. Now we have given xed support and we have to provide forces or moments. 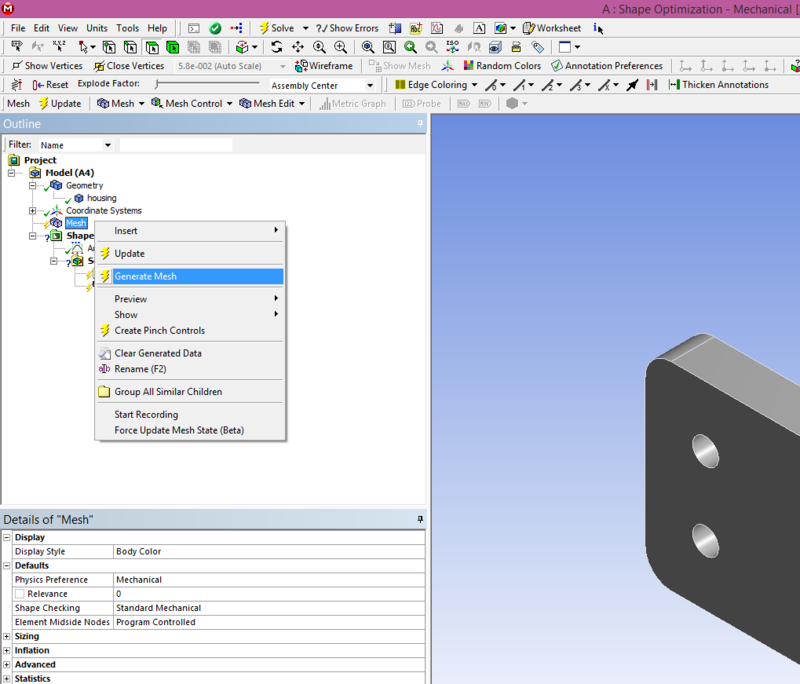 Right click the Shape Optimization and select Insert and Force. figure. You can give forces or moments of your choice. 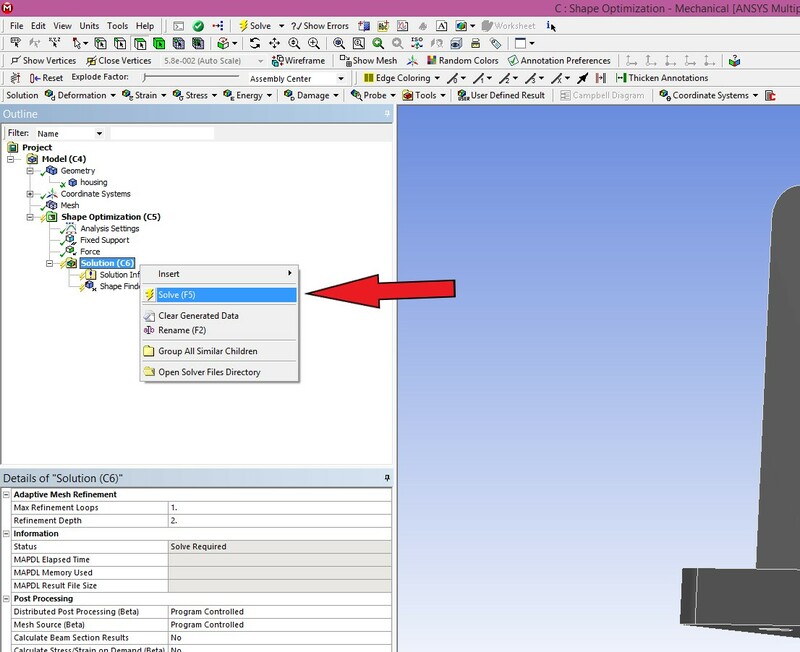 ning the material, fixed support and forces in required directions you will get Thunderbolt symbol beside Shape Optimization, Solution Information and Shape finder. Target Reduction is the factor by which your part weight will get reduced from previous weight. Select Unaveraged in Display Option in Integration Point Results section. parts. Once the solution is complete the thunderbolt symbols are replaced by green tick marks. 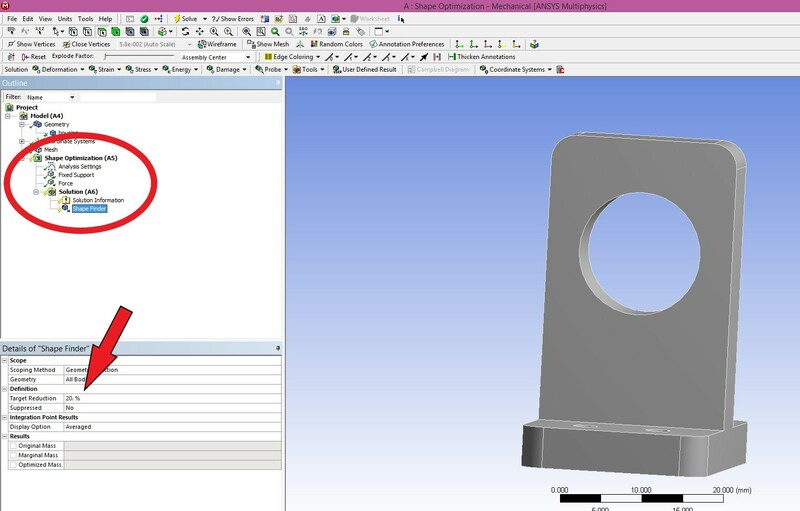 Click the Shape Finder to visualize the calculated results. grey.The details are given below. 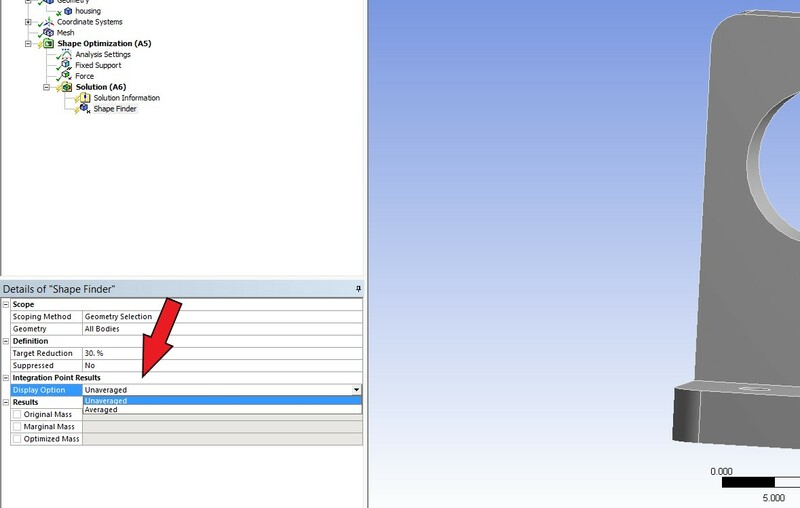 section in the drop down menu of the grey cube in the top left corner.